Before Christmas you’d said that your album was going to be mainly instrumental, so is I’ll Do Happiness with Terry Reid one of the few tracks with vocals? “Well, originally, it was kinda going that way. But I’ve been spending a lot of time in LA and that’s given me the opportunity to try some different things with some different people. All the other solo records I’ve done have been in Boston, and there’s a lot of great talent there, but there’s so many great singers out in LA and they tend to be around between tours, so that opens up new possibilities. “For instance, one day I got a call saying ‘Oh, how would you feel about doing something with David Johansen?’ and the next thing you know he’s in the studio. He’s an old friend, we wrote some songs together in the 70s, but I hadn’t seen him since the Dolls toured their last record [2011’s Dancing Backward In High Heels]. So he came out and we wrote some songs and sang them and they turned out great. And then [producer] Jack Douglas mentioned that he knew Terry Reid and that he lived only a few hours away and I had the opportunity to get together with him too. “Terry wasn’t that big here in the States in the late 60s, but I had friends who would go to England every summer and bring back piles of albums, and so I was lucky enough to know about him and when I heard him I thought his voice was incredible. So he came in and we got to know each other a little bit and played some tunes, and wrote some songs, and he was just great to work with. And so I wanted to get something out there for people to hear. I haven’t actually decided how I’m going to release some of this music, because I don’t really know if putting out an album is the right way to go, if people don’t buy albums the way they used to. “But yeah, going back to your question, it seems now that the album is leaning towards more vocals on songs, because I’m getting to work with great singers and it’s been a lot of fun. But it might be that we release an instrumental EP and an EP of vocal stuff, I don’t know: we’re just cranking out the songs, and we’re having conversations about how we get it out there. But I wanted to get one of these Terry Reid songs out because they turned out really good. There’s been some pieces in some of the big newspapers out here which have been about people re-discovering his talent, so the timing is kinda falling together. Are you still recording and accumulating songs then? Have people started to approach you about contributing to the solo album? Is there anything you writing that you’re setting aside for Aerosmith? Is there no deadline for the music you’re working on now? 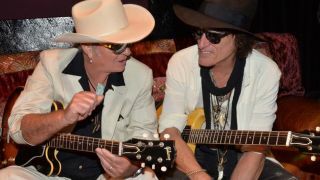 The next issue of Classic Rock, featuring Joe Perry and Terry Reid on the cover CD, is published on April 20.